A slender shrublet, up to 400 mm high. The stems arise from a woody rootstock and turn reddish with age, and are covered with white hairs on 2 sides of the stems. The leaves are linear to oblong, shortly petiolate and are covered with long, white hairs on the abaxial side (undersurface of the leaf), midrib and margins. 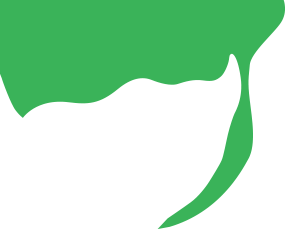 The apex (leaf tip) is tapered into a sharp point. 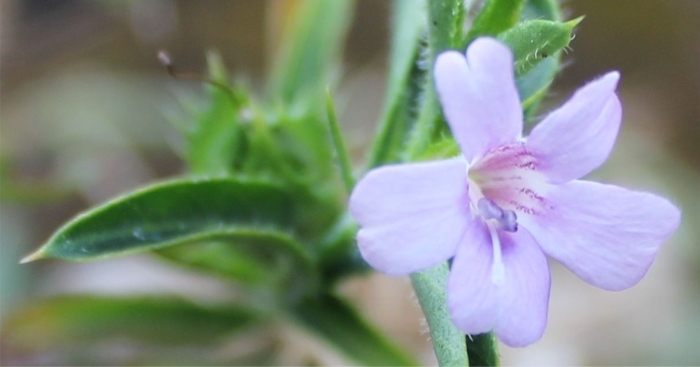 The flowers are small, mauve with darker markings in the throat. The corolla is 2-lipped. The upper lip is 2-lobed and the lower lip 3-lobed. Hairs are visible on the corolla lobes. The flowers are subtended by calyx lobes. The outer calyx lobes are elliptic, covered with white hairs; the margins are toothed and the apex ends in a sharp point. The bracteoles (secondary bracts) are lanceolate, hardened and hairy, with or without 1–3 lateral teeth on the margins. The seed capsules are elliptic, with 4, hairy seeds per capsule. The ripe fruit capsule opens explosively when it is moistened. 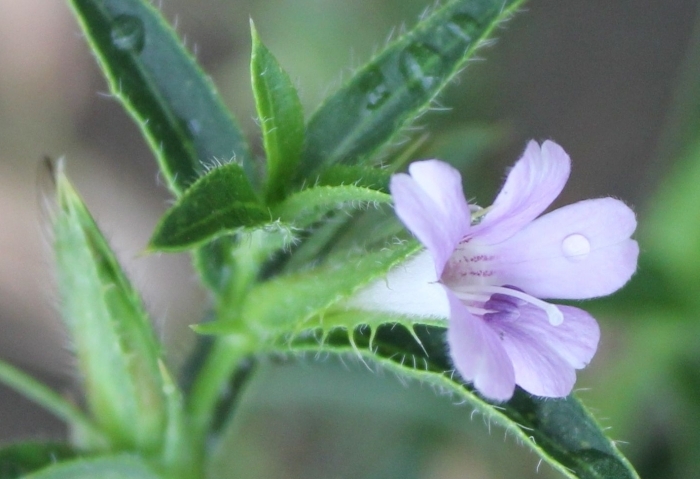 According to the Red list of South African plants Barleria oxyphylla is assessed as Rare. Barleria oxyphylla is found growing in the Kruger National Park, Lowveld of Mpumalanga, Mozambique, Swaziland and northern KwaZulu-Natal, in turf soils. The genus Barleria consists of a large group of shrubs, shrublets and herbs and the genus is named after the Dominican monk and French botanist, Jacques Barrelier (1606–1673). There are about 300 species worldwide. The species name oxyphylla means ‘loving acid soils’. Barleria oxyphylla is pollinated by insects and attracts various species of butterflies. This species is frost tender, grows well in full sun and does not need a lot of water, and prefers to grow in full sun. It flowers in summer, from October to April. 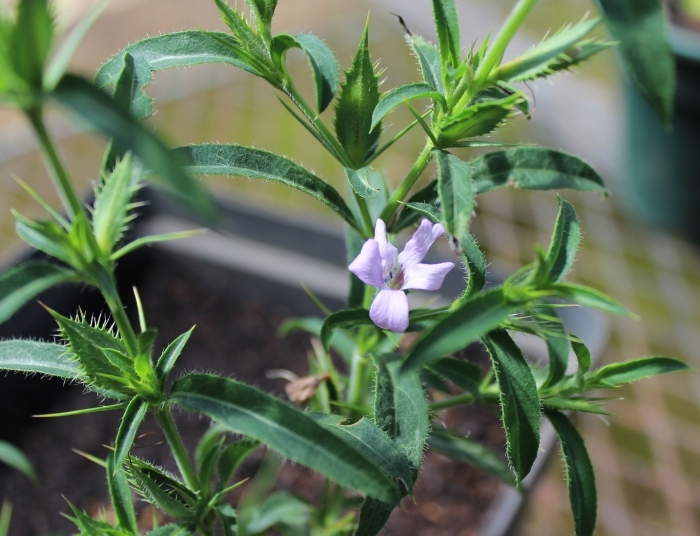 Barleria oxyphylla grows easily from seed or cuttings. Harvest the seed from the ripe capsules. Sow the seed in summer, from December to March, in a container in a mix of 1 part washed river sand and 2 parts potting medium. Place the container in a shady spot and water once a week. Germination starts to take place in fourteen days. 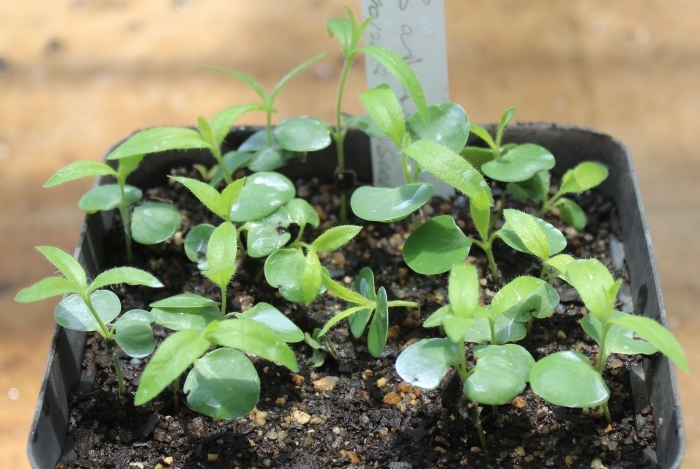 Transplant the seedlings when they are 10 cm tall. Semi-hard plant material is the best for cuttings. Cut the cuttings in lengths of 10 cm. Plant the cuttings in a mixture of 1 part coarse river sand and 2 parts potting mix. Good drainage is essential. Treat the cuttings with a rooting hormone. Plant the cuttings 5 cm apart. Place the container in a shady spot and water twice a week. Plant the rooted cuttings in a good potting mixture. Expect a success rate of 80%. Little, J. R. & Jones, C.E. 1980. A dictionary of botany. Van Nostrand Reinhold Compony, New York, Cincinnatti, Toronto, Melbourne.